1988 Internal Shell Report "The Greenhouse Effect"
This 1988 Shell report, discovered by Jelmer Mommers of De Correspondent, shines light on what the company knew about climate science, its own role in driving global CO2 emissions, the range of potential political and social responses to a warming world. A thorough review of climate science literature, including acknowledgement of fossil fuels’ dominant role in driving greenhouse gas emissions. More importantly, Shell quantifies its own products’ contribution to global CO2 emissions. A detailed analysis of potential climate impacts, including rising sea levels, ocean acidification, and human migration. A discussion of the potential impacts to the fossil fuel sector itself, including legislation, changing public sentiment, and infrastructure vulnerabilities. Shell concludes that active engagement from the energy sector is desirable. A cautious response to uncertainty in scientific models, pressing for sincere consideration of solutions even in the face of existing debates. A warning to take policy action early, even before major changes are observed to the climate. 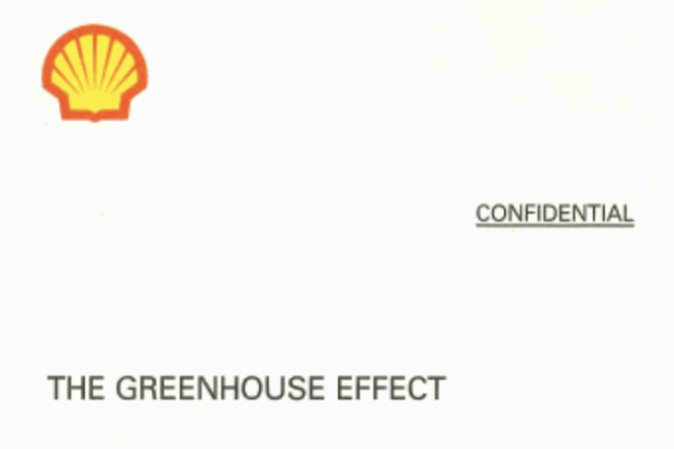 In short, by 1988 Shell was not only aware of the potential threats posed by climate change, it was open about its own role in creating the conditions for a warming world. Similar documents by ExxonMobil, oil trade associations, and utility companies have emerged in recent years, though this Shell document is a rare, early, and concrete accounting of climate responsibility by an oil major. Later, the authors quantify Shell’s products’ unique contribution to global CO2 emissions by segment. According to this internal analysis, Shell’s products (oil, gas, and coal) were responsible for 4% of total global carbon emissions in 1984. This is one of the earliest examples of carbon accounting by an oil major, and consistent with Richard Heede’s “Carbon Majors” methodology of tracing carbon responsibility back to the producers. Shell’s analysis draws on much of the best available scientific research of the time, detailed in a lengthy appendix. The authors also include details of a report Shell commissioned from the Climatic Research Unit (CRU) at University of East Anglia in 1981. The research was later extended for Department of Energy and published by the U.S. government in 1984. Shell’s relationship with CRU and Director Wigley continued until at least 1985. No surprise, Shell examines the physical, financial, and political impacts of a warming world to its own business. It notes the risk of legislation and “changing demand for our products,” as well as new business opportunities in alternative fuels. Shell also anticipates the “environmental problem” forcing a policy response, the need for international government action, and the reputational risk of “political anxiety.” It’s up to investors to assess if these and other risks were adequately disclosed in subsequent years. In light of these “strong stakes,” the authors advise active engagement from the energy sector in discussions of policy and programs. Shell continued to develop the Triton Coal Mine in Campbell County, Wyoming for years. Big Oil thought that they wanted to be “Integrated Energy Companies,” until the limited prospects of putting “rocks in the box,” became antithetical. The upsides to the petroleum industry that provide gamblers with the casino effect, is lacking in the quotidian mining industry. Big Oil did force Wyoming to open up the Powder River Basin (PRB) for coal mining, and they brought the railroads in to the sparsely populated region. New York State drove the PRB more than Wyoming in the 1970s. The high sulphur coal of the Mid-West was killing the Adirondack Lakes, with acid rain. Low sulfur coal from the PRB solved those problems, but made others worse. Once Wyoming’s politicians capitulated, they sold out to the companies that made the biggest campaign contributions. Today WY pays lip service to coal miners, but advocates in the interests of the corporations. The WY embrace of the Office of Surface Mining’s Stream Protection Rule, is exhibit “A” for our politicians stabbing Wyoming working coal miners in the back, while supporting the corporate agenda.